Senate Majority Leader Becca Balint, D-Windham. Two legislative leaders from Windham County ask: Is the governor a laissez-faire leader, or did the administration’s 11th-hour involvement in the state budget process mark the start of a battle for Vermont’s progressive soul? A request for comment from the governor’s office was not returned by press time. Correspondent Olga Peters, the news director for WTSA in Brattleboro, plans an audio version of this story at soundcloud.com/wtsanews. BRATTLEBORO—The 2017 legislative session started quietly in Montpelier. The level of alignment between the priorities of Democrat-controlled Legislature and Republican Gov. Phil Scott on issues like mental health, child care, the opioid crisis, and the budget made for a relatively tranquil session. That wasn’t a surprise. As a senator and lieutenant governor, Scott held a reputation for sitting everyone down at the table and hashing out solutions to divisive problems. But then, mere weeks before the Legislature adjourned, the kumbaya stopped and the political battles began. 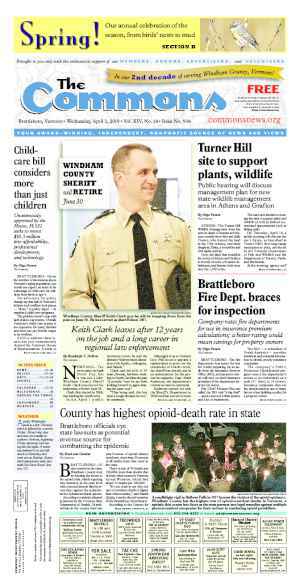 For two Windham County lawmakers who are leaders in their respective chambers, what started as a strong session, ended because of — in their opinion — Scott’s poor leadership. Scott has, in their view, usurped his own authority and given it to staffers who, rather than being experts in their fields, are ideologues. Senate Majority Leader Becca Balint, D-Windham, and House Majority Whip Tristan Toleno, D-Brattleboro, expect the 2018 Legislative session to be different. Scott wasn’t the governor anyone expected him to be, the lawmakers said. 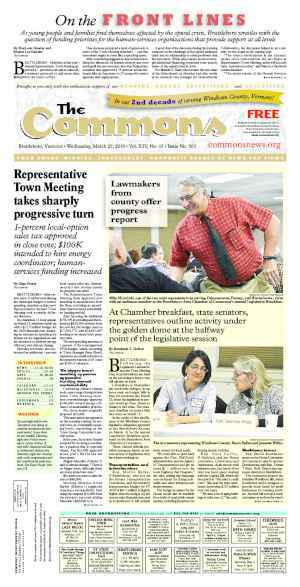 The 2017 budget process followed the normal budget- building process, Balint and Toleno said. Most unusual was the budget’s high approval among legislators in both chambers, where it passed 143 to 1 in the House and unanimously in the Senate. “That’s unheard of,” Balint said. Scott threatened to veto the appropriations and tax — or yield — bills in favor of changes to teachers’ health insurance. According to Toleno, Scott created a “political firestorm” when he jumped into the budget process at the last minute. Toleno said the governor had positioned himself as the champion of reorganizing how health insurance for teachers and support staff is negotiated. “He did so in a way which upended a pretty amazing, feel-good process around the budget that was very short-lived,” Toleno continued. Balint added, “The opposition was never about the spending priorities, it was not about the appropriations, it was about this separate issue connected to the yield bill around how we would deal with” teacher and support staff insurance. 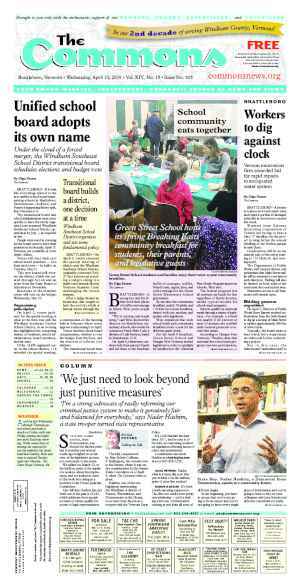 The lawmakers noted that most of the public discussion fell on teachers’ health benefits. But, they said, Scott’s plans also included paraprofessionals and support staff who aren’t compensated in the same way as teachers. “Any changes in health-care benefits [are] going to greatly impact [paraprofessional and support staff’s] bottom line month-to-month, and that was very troubling to us,” Balint said. Balint said the Legislature’s response to the governor’s health insurance idea was the same as it was to all of the sweeping changes he offered during the session: Put it through the legislative process. In Balint’s opinion, a citizen legislature is at a “distinct disadvantage.” As the issues like insurance or energy become more complex, the lawmakers haven’t gained additional staff to help them vet information. Through multiple news releases and press conferences, Scott outlined his belief that the state could save $26 million if teachers negotiated their health insurance directly with the state and not local school boards. With the threat of a government shutdown on July 1 hanging in the air, the administration and legislature returned for a special veto session on June 21 and negotiated. Toleno said the $1.5 billion budget that eventually passed was almost identical to the one Scott vetoed. But Scott did save approximately $13 million by using spending thresholds to curtail spending on education health benefits. The mechanism used to ensure savings became known as the Ashe Amendment. It was named after Senate President Pro Tem Tim Ashe, who had the dubious honor of having his name at the top of the list of all those who had signed onto the legislation. In brief, the amendment sets spending thresholds based on comparisons of fiscal year 2017 to 2018, Balint said. School districts that spend above the threshold will have the money they receive from the state cut by the same amount. Some school districts completed their contract negotiations before the special veto session and may already be on the wrong side of the Ashe thresholds. Balint and Toleno said the $13 million saved means taxpayers will see a reduction of approximately $10 to $15 per $200,000 of assessed house value. “It’s mostly symbolic,” Toleno said. He added that while Scott championed the health insurance idea, the idea was never his but came from, in part, the Vermont School Board Association and the Vermont Superintendents Association. Balint noted that the $26 million was only ever a concept. That bottom line was predicated on every school board returning their respective savings to the state. But, she added, most school boards have other pressing financial needs, such as fixing roofs or buying new lab equipment. It’s unlikely the whole $26 million would have gone back to the taxpayers, she said. She describes one moment in time that shifted the relationship. The way Vermont government is structured, the Legislature develops the policy — or plan — and then the administration executes it, Toleno said. When the Administration refuses to have conversations, “that undermines the whole process for Vermonters” and develops less effective public policy. Toleno characterized Scott’s relationship with the Legislature as “a bunker mentality” that, if it continues, will only make things worse for Vermonters. Toleno said that, traditionally in Montpelier, legislators build policy through a combination of formal and informal processes. The formal includes the committee hearings, floor debates, and public documents. The informal consists of discussions over lunch, or quiet moments in the hallway. He continued saying that what he saw this year was that the Administration refused to have either public or informal conversations with members of the Legislature. “They didn’t seem to understand or value the deep tradition of finding quiet ways to work together so that then the public ways could start to show up,” Toleno said. Balint said that Scott stepped into the governorship with “a tremendous” amount of goodwill, support, and trust in the Senate. It was hard for many of his peers to swallow Scott’s budget veto, she said. Toleno believes that, despite its frustration, the Legislature could quickly rebuild bridges. The governor, however, needs to take a hard look at himself. “The challenge here is that the governor has to decide who he is,” Toleno said. He hopes Scott will take this summer and do just that. “Because I don’t think the Phil Scott we’ve seen as governor is who we thought he would be,” Toleno said. Balint said Scott “cares deeply” about the opioid crisis and how it hurts schools. He cares about workforce development and strengthening the economy. He cares about families living in poverty, she said. Or, “some of the old Vermont Yankee Republicanism, which was thoughtful and slow, but could ultimately find its way to very progressive thinking,” Toleno added. Balint said one way forward is to keep reminding the governor and his team that the Legislature are policy-driven. “We want to deliver good policy that takes care of the most vulnerable,” she said. Balint is prepared to keep making policy despite Scott’s threatened vetoes. Toleno pointed to the staffers who Scott hired. He didn’t want to name names, but Toleno did say that in some key areas Scott hired people without any knowledge of the area they were hired to work in or how state government works. “Strong ideologically, completely inexperienced,” Toleno said. “No policy chops,” Balint said. “Somewhere along the way, my feeling is, the national Republican Party said, [to Scott] ‘you’re doing great work, you have an opportunity to weaken the teachers’ unions and you have an opportunity to do some real damage there and you cannot let your foot off the gas,’” Toleno said. Toleno said Scott took outside money for his gubernatorial race, and that the National Governors Association is putting political pressure on him. “And no one has gotten to the bottom of why he was willing to do all of this damage for something that’s really so small,” said Toleno. Toleno said that Republican political operatives have pledged to infuse new money in Vermont elections. Some, he said, showed up in Montpelier in the middle of the session — about the time things became very political. “We take that threat very seriously. We in the House are hoping to be competitive in every single race in the state, and we were definitely impacted in the last election cycle by ads targeting certain Democrats in certain areas,” Toleno said. Toleno has tremendous respect for what he calls the “old Yankee Republicanism,” like former Gov. and U.S. Sen. George Aiken of Putney. But, he said, the generation of people who embodied that practicality and collegiality are dying out. In the House, Toleno figures about five to 10 lawmakers reflect that worldview. The younger generation of Republicans in his chamber are far more ideological, he said. 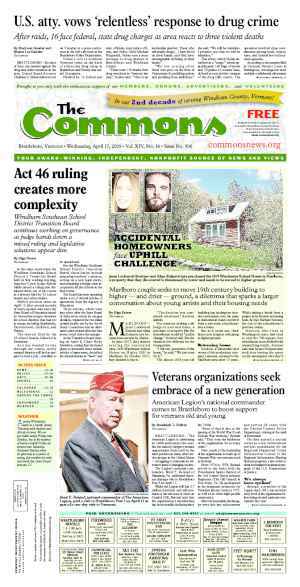 “When we lose that [older generation], it means we’re going to be in an even-more-hyper-partisan [environment] in Vermont without the tools we’ve had of a historical commitment to collaboration,” Toleno said.